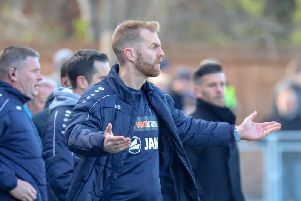 Match-winner George Thomson is hopeful that Harrogate Town's dramatic stoppage-time success over Dover Athletic will prove to be the catalyst for a strong finish to the season. The 26-year-old winger popped up with a stunning 92nd-minute strike as Simon Weaver's team fought back from 2-1 down to claim three valuable points in Kent on Saturday afternoon. George Thomson applauds the Harrogate Town fans at full-time. Their 3-2 triumph means that the club have actually recorded back-to-back wins in the National League for the first time since early October, yet these were punctuated by a disappointing display at home to Stockport County which saw them dumped out of the FA Trophy. And although they have now emerged victorious in three out of their last four matches in all competitions, Town were without a win in five prior to that, something of a lean spell by comparison to their impressive early-season form, a run which Thomson hopes they can emulate during the business end of 2018/19. "It was a scrappy game. We've played miles better than that and not come away with results. Today we've not played as well as we could and we've come away with three points and at the end of the day, that's all that matters," he said. "It was just one of those things, it just seemed to change for us in that last minute and hopefully now we can use that as a way of going on a run and getting back to winning ways and getting that feel-good factor going again. "We've got 15 games left now and it's how many can we win out of that 15 and see where we end up. "We just need to focus on our own form and continue to get points on the board." Having led through a Mark Beck strike all the way from the seventh minute through to the 79th, it appeared as if Town's long run without a clean-sheet was finally going to come to an end at the 19th time of asking. That was until Dover netted twice in as many minutes to turn the game on its head and leave their visitors reeling, yet Thomson insisted that the end result is all that really matters. "We've not kept a clean-sheet for so long and halfway through that second half we thought today's the day," he added. "We've not got the clean-sheet, but we've got the three points and that journey home was a lot better than it would have been [with the score as it was] with 10 minutes to go." Despite the 540-mile round trip, Town were once again backed by a vocal travelling contingent at Dover, prompting Thomson to highlight the difference that the club's supporters make to the players out on the pitch. "It's a very, very, very long way and to see so many of them here is a credit to them," he said of the away fans. "It does help us. We can hear them singing throughout the games and it's amazing for us to hear them at such a far away club. "Hopefully, [three points] makes that journey home a little bit better for them."